Barbara Spencer: I suppose you can make an explosive out of chewing gum? Long before he journeyed across the universe as Colonel Jack O�Neill in Stargate SG-1, Richard Dean Anderson earned high regard as the ingenious problem-solver MacGyver. The bright guy used his scientific knowledge and ability to improvise instead of brawn to succeed in a wide array of situations. The series premiered in the fall of 1985 and aired for seven seasons. 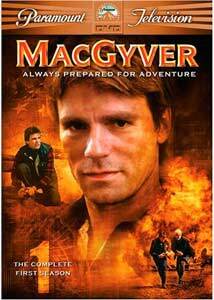 The television movies MacGyver: Lost Treasure of Atlantis and MacGyver: Trail to Doomsday followed in 1994. The show still appears often on cable today, and some of MacGyver�s deeds are common knowledge in the pop-culture arena. MacGyver is a former Special Forces agent who now works for The Phoenix Foundation, a group of thinkers who strive to defeat the bad guys through less-violent means. Although many of our hero�s actions appear ridiculous, they actually are scientific processes that would be possible. However, in order to prevent viewers from creating their own bombs and other devices, all the necessary steps did not occur on the screen. MacGyver was also unique because he never used weapons, which required him to use mental skills instead. This season includes all types of �MacGyverisms,� including stopping an acid leak with a chocolate bar, making a hot-air balloon fly with a map and duct tape, broke a wall with a coat rack, fixed a fuse with a gum wrapper, and countless other original tactics. The pilot episode immediately places MacGyver into several precarious situations that showcase his trademark ingenuity. In the prelude, he climbs a steep mountain and rescues a prisoner from a heavily armed camp in Central Asia. The primary story involves his descent (with a lovely lady) into an underground laboratory to prevent a chemical disaster and save the survivors of an explosion. This story offers elements that would occur throughout the series, but it also contains several items that would never appear again. Most importantly, MacGyver fires a gun in the opening scene, a moment that has actually been removed for syndicated airings. He also lives in a former airplane hanger, has a �little brother,� and works with a different character played by Dana Alcar (not Pete Thornton). This season does not include some of the most popular recurring characters, including Michael Des Barres' villainous Murdoc and Bruce McGill's pilot pal Jack Dalton. However, John Anderson does appear in Target MacGyver as the star's grandfather, and the stuning Teri Hatcher (Desparate Housewives) shows up for Every Time She Smiles as Penny Parker. The season's first half feels odd due to the absence of Dana Alcar as Pete Thornton�MacGyver's friend and boss. Their pairing would add weight and humor to each episode during the series' entire run. This season also includes guest appearances from such familiar faces as Robert Romanus (Fast Times at Ridgemont High), Joan Chen (Twin Peaks), and John de Lancie (Star Trek: The Next Generation). The remarkable success of MacGyver is due to several key factors. A major part is the likable nature of Richard Dean Anderson, who is able to draw all types of viewers. He makes MacGyver's down-to-earth personality and unique intelligence believable while inspiring you to care about his plight. His presence helped to lift the series above the crop of typical action shows in the '80s. Another aspect is the high entertainment value of this adventure series, which never takes itself too seriously, even when the star faces difficult circumstances. Events take MacGyver across the world to a diverse collection of exotic locales. The lack of the usual shootouts also draws audiences who might shay away from rougher and more violent material. Highlights of MacGyver: The Complete First Season include The Golden Triangle, a battle with MacGyver and villagers versus a Burmese drug lord; Trumbo's World, an oddball entry that involves a horde of killer ants; and The Enemy Within, a search for a traitor inside the Agency. The season is generally consistent and offers an entertaining adventure during each episode. Although MacGyver's survival is never really in doubt, the stories are tense and provide countless obstacles for the amazingly clever guy to overcome. Image Transfer Review: This release provides the original full-frame transfer that does not appear much improved over the television version. The events onscreen are easily watchable, but a significant amount of grain does exist. The colors are not as sharp as the typical digital expectations, but the technological limitations probably restricted the quality of this transfer. The presentation is acceptable, but the lack of significant digital remastering does slightly lessen its success. Audio Transfer Review: MacGyver utilizes a solid 2.0-channel Dolby Surround track that incorporates the explosions and action music into a energetic production. The complexity of the sounds is pretty minimal, however, due to the restrictions of the original television audio. Everything resounds clearly from the front speakers, though, which makes all of our hero's explanatory dialogue easy to understand. The oddball nature of his methods is still a mystery. Extras Review: Except for three pre-menu trailers, this set contains no extra features. This is not a major surprise given the modest list price but still is a disappointment. MacGyver is hardly a groundbreaking show, but it did provide counterprogramming to the less-clever action series that came and went during its seven-year run. The lack of any supplements is very disappointing, and the transfers are lackluster, but this release should please the show's fans and attract some new viewers to this enjoyable series.